Attribute operators (or connected operators)  is a family of contour preserving filtering operations in mathematical morphology. They can be implemented by max-trees , a compact hierarchical representation of the image. Here, we show how to use diameter closing  , which is compared to morphological closing. 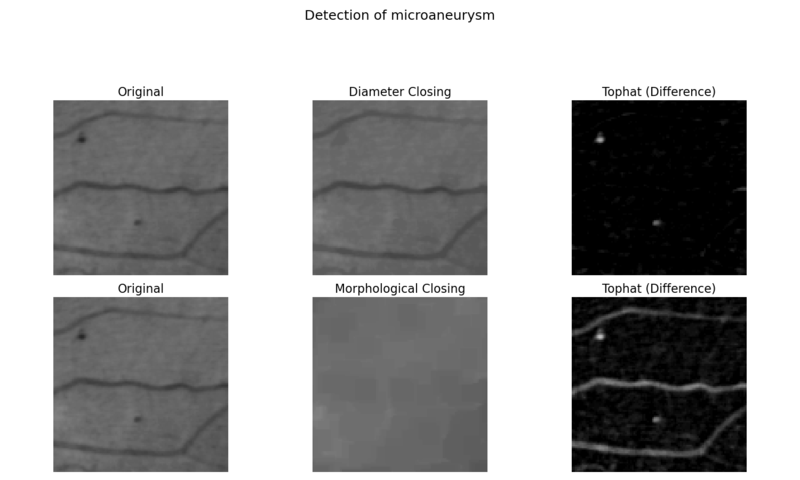 Comparing the two results, we observe that the difference between image and morphological closing also extracts the long line. A thin but long line cannot contain the structuring element. The diameter closing stops the filling as soon as a maximal extension is reached. The line is therefore not filled and therefore not extracted by the difference. # local minima have at least a maximal extension of <diameter>. # We then calculate the difference to the original image. # contain a structuring element of a certain size. # Again we calculate the difference to the original image.